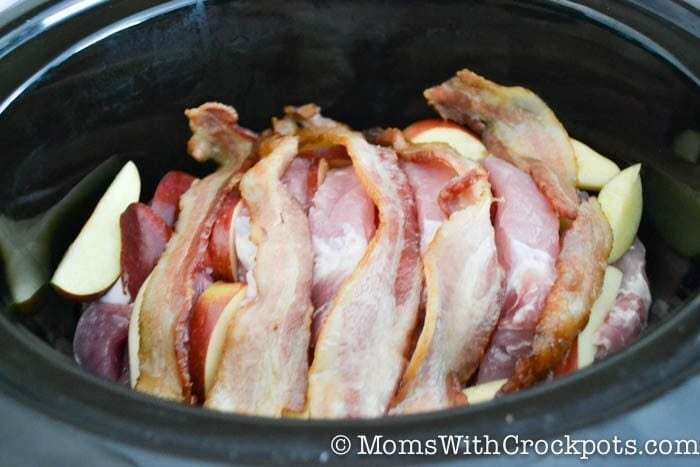 This Crockpot Apple Bacon Pork Roast Recipe is so simple, yet looks so elegant on the table. Plus it is kid friendly. The entire family will love it! I sliced up a couple of great firm apples. My favs are Fujis. I then took a 3 -4 lb Pork Loin Roast and sliced it into 1-inch pieces about 3/4 of the way through. That way it is still attached as one roast. 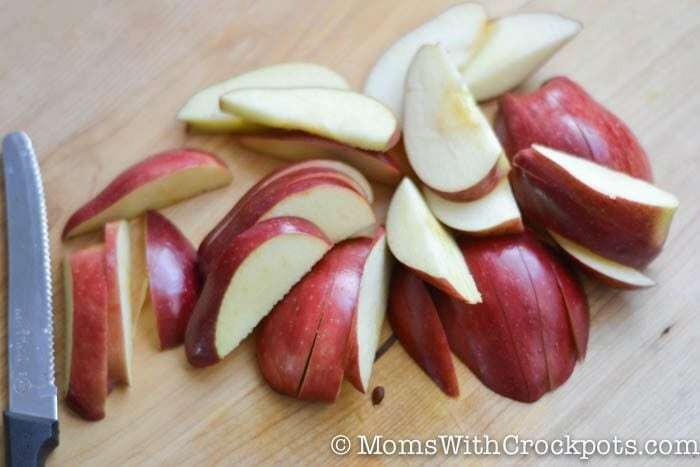 Place the roast in your crockpot and place the apple slices in the slits in the roast. If you have extra apples just scatter them through the crockpot. Then top the roast with slices of bacon. I pre-cooked mine about 1/2 -3/4 of the way done so it would be crisp when finished. You can add the bacon completely uncooked; it will not be as crisp when done. Sprinkle the whole thing with about 1/3 cup brown sugar. I placed the lid on the top and let it cook for 3-4 hours on high or 6-8 hours on low. 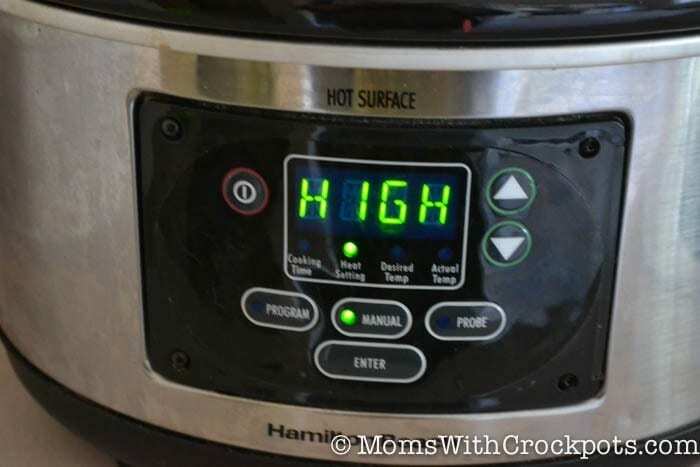 Time will vary depending on your crockpot. Keep in mind not to lift the lid to peek! Each time you do, it adds to the cook time. 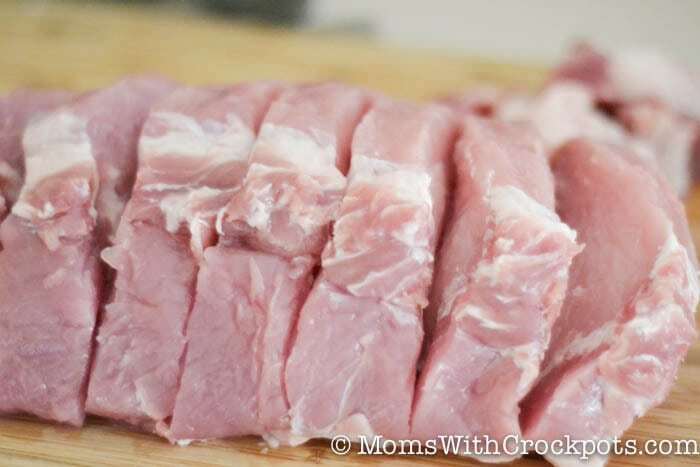 Slice your pork loin into one inch slices about 3/4 of the way through. That way the roast is still connected in one piece. 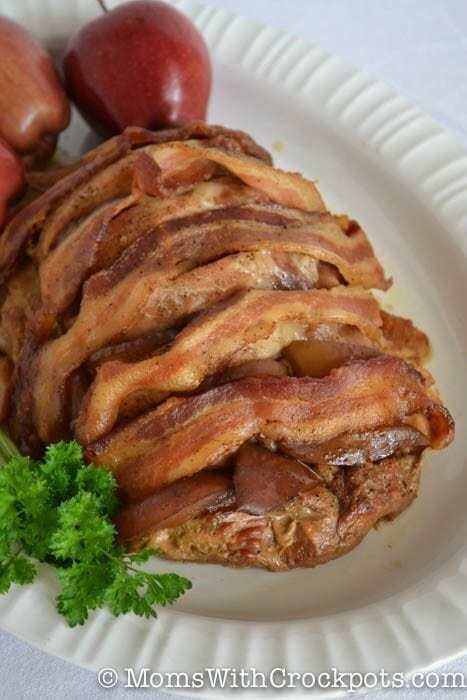 When it is finished you end up with amazingly succulent and tasty Crockpot Apple Bacon Pork Roast that the entire family will love! I made some of this amazing apple glaze to go with it when served. It will knock your socks off! Thank you for this easy receipe. My husband and I as well as our most picky daughter really enjoyed it. The pork was so tender & fell apart. Will make this again! Hi, I’m new to slow cooking and I just love your site. I’m looking forward to using more of your recipes. Delicious! The glaze on top really put it over the edge. Will def be making this one again! Thanx! Has anyone used granny smith apples in this recipe? Thats all I have on hand and I have my grandbaby today. I really need to use them before they ruin..
My son, his friend & I had this tonight & it was a HUGE hit! We all just loved it! Thanks! I wish every recipe could be this simple and delicious!!!! I made this for my husband and he loved it! This is one of our favorite fall recipes. Thanks to all who have taken the time to comment! Making this week for guests based on the great reviews – it is so helpful to hear your thoughts. Just found this recipe – and I am so glad I did. The pork was wonderful!! The glaze really added that extra something to make it special. The family loves it. I have filed this recipe away with my favorites. wish it was easier to print or have the recipe emailed to you. Lynn, you can print the recipe from the post. There is a Print it button on the recipe card in the post.